Forget calorie-counting. Forget eating the same bland diet food day after day. 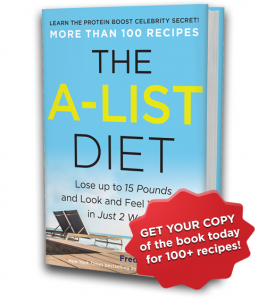 The best part about the A-List Diet is that you will lose weight by eating well—unlocking the power of metabolism-boosting amino acids in fresh, unprocessed, REAL food. I’ve included more than 100 A-List recipes in my book along with a delicious 30-day meal plan to help you get started. That way, you’ll always have fresh, enticing ideas on hand. Shopping and preparing your healthy, fat-burning A-List meals will become a highlight of your week—even if you’ve “never been a good cook” before. Here are a few of my favorite recipes to get you started. Serves 2 Ingredients: 1 avocado 1 tablespoon macadamia nut oil 1/2 teaspoon kosher salt 1 1/2 teaspoons freshly squeezed lemon juice 2 jumbo eggs Coarse sea salt and freshly ground black pepper Gruyère cheese 1/2 cup broccoli sprouts Directions: 1. In a medium bowl, mash together the avocado, oil, kosher salt, and lemon juice with a fork until it’s chunky. Divide evenly between two plates. 2. Heat a nonstick sauté pan over medium-high heat. Crack the eggs into the skillet. Season with sea salt and pepper and fry until the whites are set but the yolks are still runny, about 3 minutes. 3. Just before the eggs are finished cooking, use a vegetable peeler to shave eight thin slices of Gruyère cheese onto the eggs, allowing some of the cheese to melt onto the pan and crisp up. 4. When the eggs are cooked and the cheese melted, carefully transfer one egg onto each bed of avocado. Top each with some broccoli sprouts and serve. Serves 1 Ingredients: 8 ounces ground beef 1/2 teaspoon ground cumin 1/2 teaspoon smoked paprika 1/4 teaspoon freshly squeezed lime juice 1 large iceberg lettuce leaf 1 ounce cheddar cheese, shredded 1 tablespoon sliced jalapeño 1 1/2 tablespoons red taco sauce Directions: 1. Preheat an outdoor grill or stovetop grill pan over high heat. 2. In a medium bowl, mix the beef, cumin, paprika, and lime juice until well combined. Form a patty that is oblong rather than circular. Be careful not to overwork the meat or pack the patty too tightly. 3. Grill the patty to the desired doneness, 2 minutes per side for medium-rare. 4. Place the lettuce on a plate and place the burger on the stem end. Top with the cheese, jalapeño, and taco sauce. Fold the lettuce over the burger—no bun required. Serve. Serves 4 Ingredients: 1 pound smoked salmon, cut into 1/4-inch-thick slices 1 cucumber, peeled and thinly sliced 1 roll herbed goat cheese, cut into 1/8-inch slices Fresh thyme leaves 40 pistachios, crushed lightly Directions: 1. Top each salmon slice with a cucumber slice and a goat cheese slice. 2. Sprinkle with thyme and pistachios. 3. Roll them up and serve. Note: This recipe also makes a great hors d’oeuvres for a party. Serves 6 Ingredients: 2 pounds spare ribs (beef or pork) 2 tablespoons sugar-free soy sauce 1 teaspoon cayenne, chili powder, or a combination of the two 1 tablespoon dried thyme 2 tablespoons dried rosemary 15 drops liquid Stevia 1 teaspoon salt 1 clove garlic, grated 3 tablespoons olive oil Directions: 1. Put ribs in a roasting pan. 2. Combine all the other ingredients in a bowl and mix thoroughly. Pour over the ribs, and rub them so all sides are coated in the mixture. 3. Place in a 375 degree oven, basting the ribs every 15 minutes. If the sauce runs dry, add some water to the bottom of the pan and continue to baste. Bake for about 1 hour, or until crispy on the outside. Serves 8 Ingredients: 1 pint heavy whipping cream 4 sprigs fresh thyme 2 bay leaves 15 black peppercorns 15 cloves garlic, smashed Unsalted butter for baking dish 4 medium sweet potatoes, cut into 1/8 inch slices using a mandolin Salt Black pepper, freshly ground Directions: 1. Place the cream in a saucepan over high heat. Add the thyme, bay leaves, peppercorns, and 12 cloves of garlic. Bring to a boil, and immediately lower to a simmer. 2. Simmer for 15 to 20 minutes, until the cream takes on all the flavors. 3. In the final few minutes of the cooking process, add the remaining 3 cloves of garlic. Strain and clean, and discard the solids. 4. Lightly butter a 12-inch round baking dish, and cover the surface with a layer of potato slices. Dust with salt and pepper, and spoon some of the cream mixture over the top. 5. Repeat with another layer of potatoes, seasoning, and cream until the gratin reaches a height of 2 inches. 6. Press down gently on the potatoes to bring the cream to the top. 7. Cover with aluminum foil, and continue to cook until the top is browned or the gratin is done (when a knife slips easily into the center). Serves 12 Serving size: 2 cookies Ingredients: 1 cup almond flour 1 1/2 teaspoons baking powder (nonaluminum kind) 2 teaspoons vanilla extract 1/2 cup water 1/4 teaspoon liquid Stevia 2 teaspoons butter, melted 4 tablespoons all-natural, sugar-free, crunchy peanut butter (room temperature) Directions: 1. Preheat oven to 350 degrees. 2. Combine the flour, baking powder, vanilla extract, water, and sweetener and mix vigorously, either by hand or with an electric mixer. 3. Add the melted butter and the peanut butter. Combine all the ingredients well until a batter is formed. 4. Drop the batter in teaspoon-size lumps onto a greased cookie sheet and place in the oven for 12 to 15 minutes. Allow to cool before eating—if you can resist! Dry vermouth Organic cucumber vodka (you can infuse your own at home, or find several options on the market) Directions: Mix three parts organic cucumber vodka with one part dry vermouth. Shake and enjoy! delicious celebrity-approved recipes in The A-List Diet.